Alright, so the Super Bowl is over and we’d like to congratulate the Philadelphia Eagles for making history by winning the Vince Lombardi trophy for the first time. However, we do have a confession to make. We didn’t tune in to the Super Bowl for American football. To be honest, we can’t tell you the first thing about the sport. We did, however, tune in to watch JT do his thing onstage, and of course, catch all the amazing trailers for upcoming movies. Spoiler alert: there are some really great trailers this year. 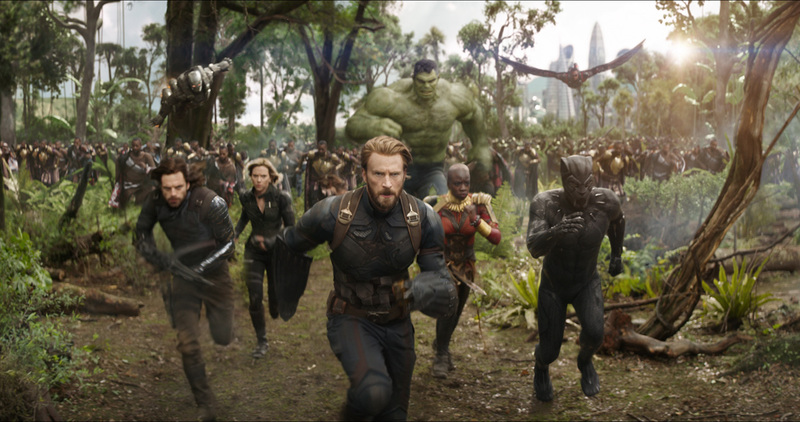 So, without boring you too much with the details, we’ve compiled a quick-fire list of all the trailers shown at this year’s Super Bowl, from Avengers: Infinity War to Mission: Impossible – Fallout. Get the popcorn. If you have a thing for scruffy-looking nerfherders, you’ll want to make time for this one, come May this year. Solo: A Star Wars Story, as you will have guessed by now, traces the origins of Han Solo. The movie will cover how Solo meets his loyal fuzzy companion Chewie, and his encounter with the notorious gambler Lando Calrissian, who’s played by one Donald Glover. John Krasinki plays Jack Ryan, a CIA analyst who ditches his office gig for field duty in order to hunt terrorists down. This isn’t the first action flick we’ve seen Krasinski in, but we’re hoping it’s better than last year’s Detroit and 2016’s 13 Hours: The Secret Soldiers of Benghazi. Krasinski is at the helm of this film too, and this time he’s directing and starring. Alongside him is his wife, Emily Blunt. Coincidence? We think not. Anyways, not much is known about this film except it’s a horror movie where a family is hunted by supernatural forces attracted by sound. The Rock aka Dwayne Johnson stars in another summer blockbuster filled with incredulous stunts, brash heroics, and unnecessary explosions. This time he plays Will Ford a former FBI operator who goes on a one-man mission to save his family. Cue dramatic music. This installation, should you choose to watch it, sees Ethan Hunt dealing with the fallout from an IMF mission that ends badly. Henry Cavill joins the cast and most of the others from the last movie reprise their roles. Here’s a fun fact about the movie: Tom Cruise broke his ankle doing a stunt in the movie and the footage is used in the final cut. See if you can spot it. Season 1 was one of the best TV shows we’ve ever seen. Great writing, brilliant acting and even better cinematography. So we’re not surprised they’ve come up with such a beautiful trailer that makes you feel so many things at once. We can’t wait to see what Westworld holds for us this year. 7) Unsolved: The Murders of Tupac and the Notorious B.I.G. Not much about this series is known except it will follow the murders of two of the biggest names in hip-hop, Tupac and the Notorious B.I.G. Steven Spielberg’s beloved Jurassic franchise gets another installation this year, and we are on the edge of our seats in anticipation. Chris Pratt and Bryce Dallas Howard reprise their roles from the previous movie, and this one hints to be pretty terrifying. Don’t believe us? Take a look for yourself. Jennifer Lawrence is no stranger to femme fatale roles so hopefully director Francis Lawrence manages to use her talents to wisely. In the upcoming film she plays a mysterious and deadly Russian spy who falls for a CIA operator played by Joel Edgerton, who convinces her he’s the only person she can trust. We’ve seen the name Stephen King come up a fair bit in the past couple of years, both on the small and big screens. This year, his characters from Castle Rock are being brought to life in a TV series for Hulu. The release of this one caught us off guard, just like the Cloverfield series itself. This installation hints at an attempt to tie up the two other movies in the series. We’re surprised at the decision to go with a Netflix release, but from this, and other blockbuster releases like Bright, we can tell which direction the cinema might be headed in. Oh, and this movie is now available on Netflix.